PEBBLE BEACH, Calif. – July 23, 2018 – Now in its 35th year, the Automotive Fine Arts Society (AFAS) returns to Pebble Beach, California with an exhibit of automotive art. As before, AFAS members participating display stunning artwork, providing the perfect complement to the vehicular art for which the Pebble Beach Concours d’Elegance is famous. Sponsored once again by the Lincoln Motor Company, an automaker formed by the early convergence of automotive design and artistic intent, the AFAS show takes place on Sunday, August 26th. Located beside the 18th fairway of Pebble Beach Golf Links, the AFAS exhibit showcases the latest artistic expressions by some of the world’s most talented artists. As the auto industry has grown increasingly global, so has the appreciation of automotive art. Already boasting an international membership, with artists residing in the U.S., Canada, the UK and France, the Automotive Fine Arts Society will once again open the exhibition to invited guest exhibitors. Those guest artists include Germany’s Hendrik Muller, France’s Yahn Janoe and India’s Vidita Singh. Lincoln Motor Company will display the new Nautilus, all-new Navigator and the new MKC at this year’s Concours d’Elegance. 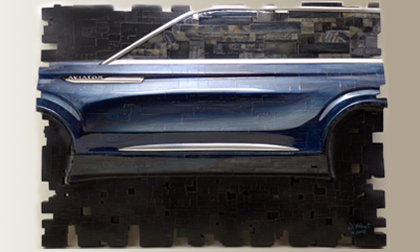 Lincoln’s Aviator preview concept vehicle will also be displayed as part of the week’s events. The Aviator preview embodies Lincoln’s future as the brand moves toward a portfolio of more utilities highlighting beauty and elegance. It also highlights the brand’s introduction of plug-in hybrid technology, resulting in Lincoln’s quietest, smoothest drive yet. To further underscore the Aviator preview’s artistry, Lincoln commissioned AFAS member Dennis Hoyt to create a sculpture for this year’s Concours. His artistic impression of the new Aviator preview measures 24 X 28 inches, and will be displayed during the weekend and presented to a lucky winner on Saturday evening. Held each August, the Pebble Beach Concours d’Elegance has earned a reputation as one of the finest exhibitions of show cars in the world. With its classic and – in many instances – one-of-a-kind creations positioned on Pebble Beach’s 18th fairway, the display attracts collectors, historians and enthusiasts from around the world. The AFAS exhibit will take place from 10:30 a.m. to 4:30 p.m. Preceding the Sunday show, AFAS will also host an exclusive invitation-only reception sponsored by the Lincoln Motor Company on Saturday, August 25th. The reception has become a popular hotspot for celebrities, art collectors and auto industry leaders to preview the latest AFAS pieces. Created in 1983 by six artists, the society made its first appearance as a group at the 1986 Pebble Beach Concours d’Elegance. Still very much involved with the Concours, AFAS is comprised of more than 25 incredible artists who continually create innovative and stunning pieces of automotive art. AFAS was established in 1983 by a group of artists who are acknowledged by critics to be among the best in their field. Members work in many diverse mediums including oil, watercolors, acrylics, wood, gouache, pen & ink, clay and metal. AFAS and its members participate in select shows across the country, including the Pebble Beach Concours d’Elegance. Information about AFAS is available at www.autoartgallery.com. First conducted in 1950, Pebble Beach Concours d’Elegance® (www.pebblebeachconcours.net) has grown to be the world’s premier celebration of the automobile. Only the most beautiful and historic cars are invited to appear on the famed 18th fairway of Pebble Beach Golf Links®, and connoisseurs of art and style gather to admire these masterpieces. Charitable donations raised by Pebble Beach Concours d’Elegance® now total over $25 million. Related events include Pebble Beach Tour d’Elegance® presented by Rolex, Pebble Beach RetroAuto™, Pebble Beach Classic Car Forum™, and Pebble Beach® Auctions presented by Gooding & Company. Pebble Beach®, Pebble Beach Golf Links®, Pebble Beach Concours d’Elegance®, Pebble Beach Tour d’Elegance®, Pebble Beach RetroAuto™, Pebble Beach Classic Car Forum™, and Pebble Beach® Automotive Week are trademarks, service marks and trade dress of Pebble Beach Company. All rights reserved.